A recognized scholar of Indigenous Studies, Dr. Kim TallBear is an associate professor of Native Studies at the University of Alberta in Canada. In 2016, the government of Canada awarded TallBear with the Canada Research Chair in Indigenous Peoples, Technoscience and Environment. TallBear is an enrolled member of the Sisseton-Wahpeton Oyate in South Dakota and descends from the Cheyenne & Arapaho Tribes of Oklahoma. She was raised on the Flandreau Santee Sioux reservation in South Dakota and in St. Paul, Minnesota by her mother, grandmother and great grandmother. Originally trained to become a community and environmental planner at the University of Massachusetts, Boston and MIT, TallBear worked on various planning projects for national tribal organizations, tribal governments and federal agencies. 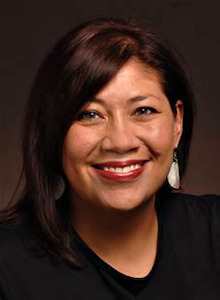 “Realizing that my deeper intellectual interests were in the cultures and politics of science and technology and their implications for tribes and other indigenous peoples, I returned to graduate school,” says TallBear, who completed a Ph.D. at the University of California, Santa Cruz in History of Consciousness in 2005.